Walter K. MacAdam, IEEE President, 1967, was a communications engineer and manager at Western Electric Company, the American Telephone and Telegraph Company, and the New York Telephone Company. Walter Kavanagh MacAdam was born 16 November 1913 in New York City. After receiving a B.S. and an M.S. in electrical engineering at MIT in 1937, he led a distinguished career with the Bell System in 1973. He worked initially for the Long Lines Department of AT&T, and in 1953 served as superintendent of engineering for the Distant Early Warning radar installation in the Arctic for Western Electric Company. 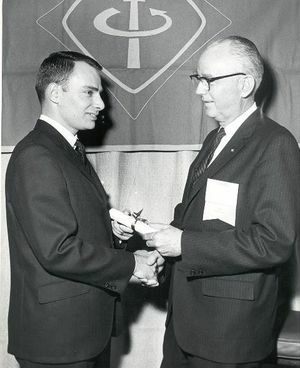 He held the position of vice president of defense communications of AT&T from 1960 to 1968, and vice president of engineering for the New York Telephone Co. from 1968 to 1973. Following his retirement, he served as a consulting engineer for several firms in refuse-to-energy technology. At the IEEE Mr. MacAdam served as a director from 1963 to 1968, as a vice president in 1966, and as president in 1967. He received the IEEE Centennial Medal in 1984. He held two patents. He was awarded the Theodore Vail Medal from the Long Lines Department of AT&T "for initiative, courage and heroic action" when he saved a life in 1938. Locally, he was active with the Lions Club, Meals on Wheels, the Pinewood Village Association and especially St. Denis Catholic Church. His 1996 book "Beyond the Bozeman Trail: The Story of Alexander Wichart," documented his greatgrandfather's Civil War and Western military experience. MacAdam died on January 24th, 1999. This page was last edited on 8 March 2016, at 17:32.